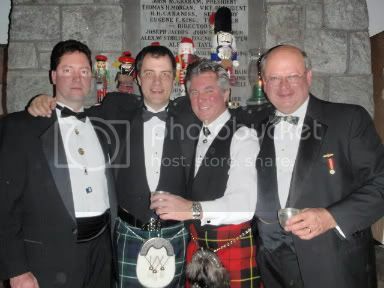 Jason Graham, Beaux Pettys, Bill Wallace and David Llewellyn take time out of the Burn's Night celebrations at the Burns Club of Atlanta to pose for this picture. The Burns Club of Atlanta is a Literary Society and is part of a world wide federation dedicated to the memory, works and ideals of Robert Burns. Membership for the Burns Club is capped at 100 and is invitation only.